With dimensions that closely match a big-block gasoline engine, the Duramax-based VGT series diesel is attractive for re-powering. Part of what makes the Duramax viable for boats is the block’s noise- and vibration-dampening features. Deep-skirt cylinder-block structure helps add strength, as do the bearing caps connected to the lower part of the block with side bolts in addition to the main bolts. Six 14mm head bolts are used per cylinder, and within the gray iron-alloy block spins a 4340 forged-steel crankshaft. The 6.6-liter 32-valve V-8 diesel is practical for re-powers because it fits in virtually the same dimensional envelope as a gasoline big-block V-8 such as the MerCruiser 8.2 MAG HO. The VGT engine weighs 992 lbs (450 kg) dry, compared to the 1,080-lb (490-kg) 8.2 MAG HO. The VTG is 30.7″ long by 32.5″ wide by 38.2″ tall (799mm x 825mm x 969mm). The 8.2 MAG HO is 33.8″ (858mm) from the front pulley to the rear mount, and 37.8″ (716mm) wide. 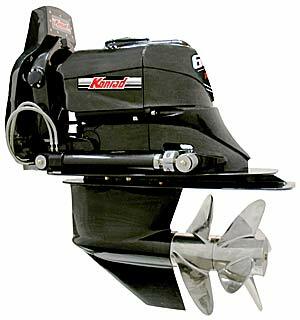 Konrad Marine’s 600 series drives are designed and built to effectively handle the added torque that diesels produce. The VGT series is available as an inboard or a sterndrive. 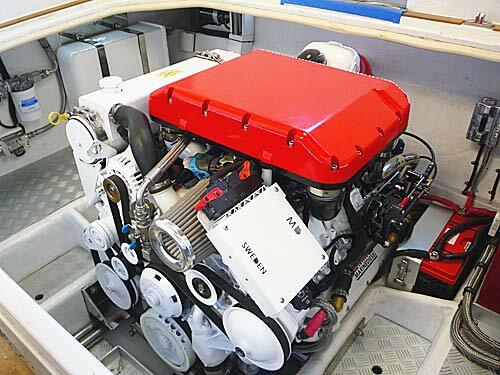 For the latter, Marinediesel packages the engines with Konrad Marine’s 600 series drives, available in three models. The 600 is a twin-prop drive for up to 16″-dia. (406mm) props, while the 680 is designed for twin 20″-dia. (508mm) props. For single-propeller applications, the 620 can accommodate up to a 20″-dia. prop. “These are the only sterndrives on the market capable of handling this power for commercial use,” said Marinediesel’s CEO and special projects account manager, Andreas Blomdahl, of the Konrad drives. Konrad Marine is also working with Gale Banks Engineering, an automotive performance accessories company in California, on that company’s version of a 6.6-l Duramax diesel. The engine is in development, but initial press releases estimated its top horsepower will be 700 (522 kW), which suggests it has either a supercharger or turbo system. Contact Sweden Marinediesel, tel. +46 431 801 30; Performance Diesel Inc., tel. 281464-2345; Konrad marine, tel. 715–386–4203.